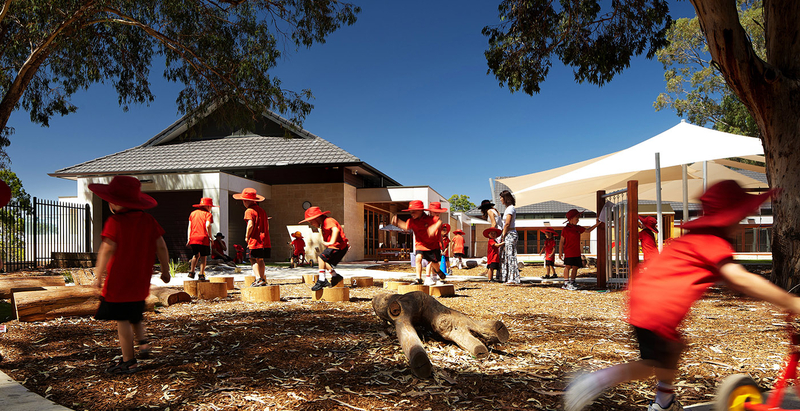 The new Early Years Learning Centre has enabled Aquinas College in Salter Point, Western Australia, to add Kindergarten, Pre-primary and Years 1 to 3 to their existing Year 4 to 12 program. The new Centre facilitates the smooth, careful transition of young children into the school environment. 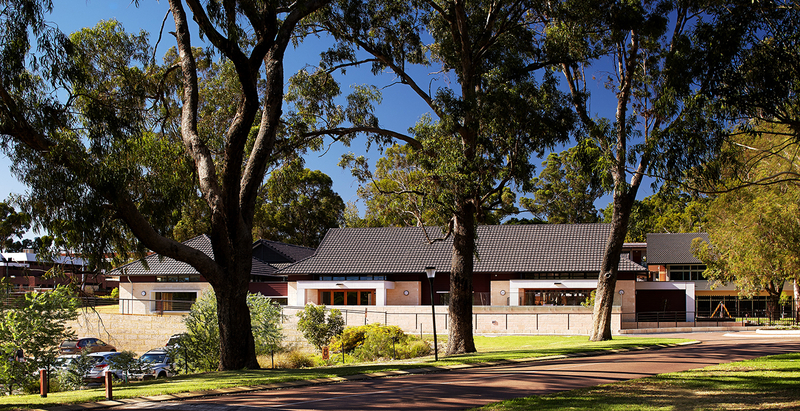 The buildings are located to the north of the existing junior school campus at the entry to the College. They are arranged so as to retain the existing mature trees as a feature in the natural play area for the Centre. The centre is conceived as a ‘village’ of single storey, accessible buildings. Verandas, bay windows and overhanging roofs all help to reduce the scale of the buildings, giving them a homely feel, appropriate for kindergarten children. The buildings are arranged around a shaded courtyard. This is the heart of the ‘village’ and allows children at play in the nature play area to be observed from within the buildings. Internally, classrooms have high-ceilings and protected openings on both sides so the rooms are cooled naturally through cross ventilation. The Building Management System automatically responds to environmental conditions and operates the louvers to suit, purging the building at night and minimising the requirement for air conditioning. Solar photovoltaic panels are located on the north-facing roof to help power the buildings. The glazing provides controlled views out into the environment and enables the rooms to be naturally lit. 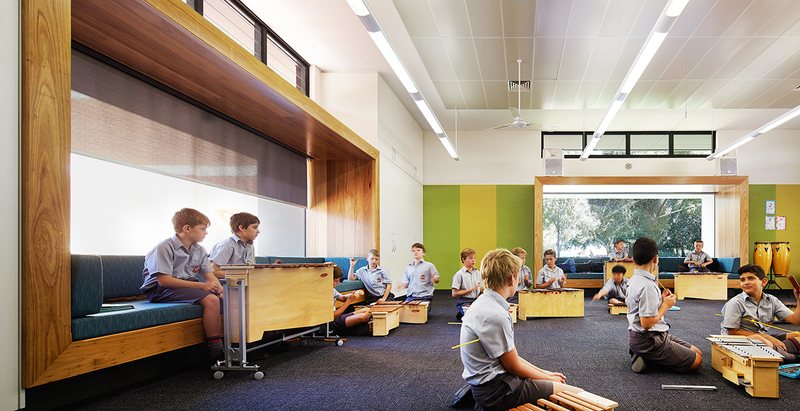 Learning pods provide a more intimate space for quiet interaction of small groups within the classrooms. Colours and materials have been selected for their quality and timelessness to reflect the College’s ethos and complement the existing buildings and to tie in with school colours. Materials and finishes are calm and neutral. Timber doors are provided to link the indoor and the outdoor spaces. Natural, maintenance free and locally sourced materials have been used where possible and initiatives in the landscape design help introduce young students to the concepts of water collection. Rainwater from verandas is collected and reused in vegetable gardens in the early learning playground. 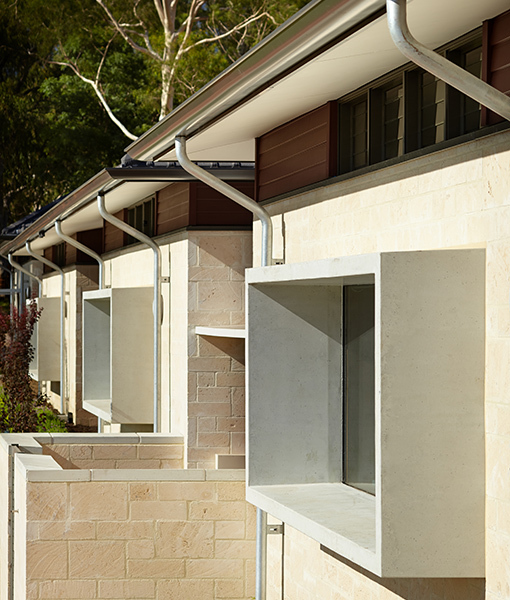 This project is the recipient of a Commendation in the 2014 Australian Institute of Architects Awards.